Profile: Zak joined Swindon Supermarine in the summer of 2016 having spent the previous four seasons with fellow league side North Leigh where he was a regular goalscorer from central defender. 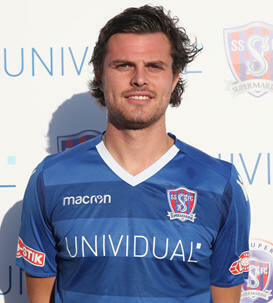 Before joining North Leigh he was with Cirencester Academy and Cirencester Town where he made his debut in 2009. He is a good footballer who will often be seen playing the ball out of defence and supporting his teammates in midfield and was made club captain last season. He is dangerous at set pieces and scores the odd goal or two. Zak was on former manager Dave Webb’s radar for a couple of seasons prior to signing. He’s experience, grit and determination will always rub off on his teammates, especially the younger players in the squad.